Article : Holiday Meals on Grills! 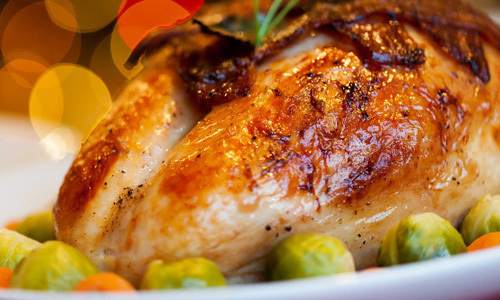 It’s prime time for holiday get togethers, and what’s a party without great food? If you want to wow your guests at Christmas, New Years, or that ugly sweater party, don’t forget about the grill! Not only will grilling free up space in your oven for other dishes, but it brings a bit of the unexpected and a nod to sunnier days to your gatherings. (Plus you’ll have an excuse to escape outdoors when your relatives get a little too close for comfort.) Here are some helpful tips and recipe suggestions to get the most out of your holiday grilling. 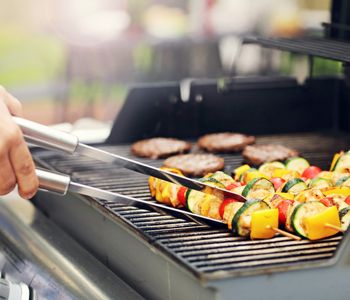 Before you get started, let’s review some basic safety tips for cooking with your gas grill. First, never grill inside a garage or other enclosed space. It can be tempting to relocate somewhere warmer while you grill in the winter, but your grill needs to stay outdoors to avoid fire hazards or inhalation of smoke and gas. Once your grill is in the perfect spot away from any structures, preheat to make sure the grill is at the necessary temperature before adding your food. This is even more important in colder months, when it may take a little extra time for the grill to warm up. Fortunately, PGS grills heat up in about 10 minutes in optimal conditions, but you’ll still want to check the temperature before throwing that shrimp on the barbie. Whether you're grilling in the summer or winter, it's always critical to keep the cover closed as much as possible to avoid losing too much heat. Let the grill do its job! And as always, you’ll want to keep a food thermometer handy. No one wants cold food or food poisoning for Christmas! Now on to the main event – the food! Whether you’re looking for traditional fare or want something a little out of the ordinary, your gas grill can handle the job. A gooey, literal take on grilled cheese — Martha Stewart’s grilled cheese wheel. Go for a simple classic with grilled tomato crostini. For something a little less fancy but with plenty of zing, wrap some jalapenos in bacon and stuff them with cheese and chorizo. Eating pork is a New Year’s Day tradition for many. Rumor has it this is because pigs root with their noses forward, symbolizing moving forward into the New Year. And pork is a grill's best friend, with plenty of delicious ways to prepare it. Add some spice with Alton Brown’s tenderloin recipe with adobo, lime juice and cilantro. What's better than pork? How about pork wrapped in more pork, like this bacon-wrapped pork tenderloin? Take your pork in another direction by grilling some barbecue baby back ribs. If seafood is more your style, cook up this grilled shrimp with garlic and herbs. A great marinade is key for grilling chicken — click here for a simple one to try. Instead of the traditional sauerkraut for New Year’s, why not grill up some cabbage? Eating this green veggie is said to be indicative of money, leading to wealth in the New Year. Grilled asparagus is another green crowd-pleasing favorite when it's roasted with olive oil, salt, and pepper. Mushroom skewers can be used as a side or an appetizer. Bundling your meat, veggies, and potatoes in a foil packet is a great way to evenly cook everything at the same time and lock in moisture. Plus it makes clean up a breeze so you won't spend hours doing dishes after the party. Try these tasty butter garlic herb steak packets. You can even grill a breakfast packet for Christmas morning! The possibilities for grilling are endless — so fire up your AEI gas grill and get cooking this holiday season!